This was a simple (as the name suggests) project I created as a testbed for my AVR microcontroller knowledge. Unifying my knowledge of each of the hardware components (timers, ports, etc.) with programming concepts I had discovered (state machines, etc.) this served as a small yet practical project. 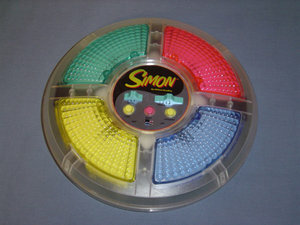 Using a MEGA16 (but portable across most of the AVR range), this serves as a clone of the popular "Simon" game; four LEDs are matched with four pushbuttons. A small sequence is flashed on the LEDs, which the player must repeat exactly on the pushbuttons. After each completed sequence, the sequence length is increased and the cycle begins again until the player makes an error in his or her repetition. I have since released the project as a learning aid to others in the AVRFreaks projects section.